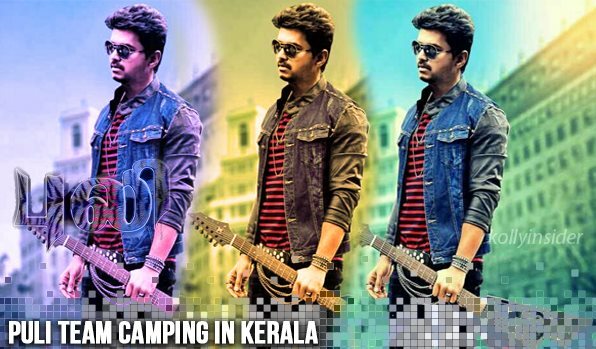 It looks like Chimbu Devan is finding the best locations to shoot his magnum opus Ilayathalapathi Vijay starrer ‘Puli’. Directed by Chimbudevan, Puli is shaping up at a brisk pace. The first leg of shooting was held in the backdrops of gigantic sets that were raised in the acres of land across ECR. The latest what we hear is that ‘Puli’ film shoot has completed a long schedule in Chennai and the star studded team is packed their bags to Kerala. Puli team is currently shooting for a crucial schedule at Athirapalli falls in Trisshur district, Kerala, which is known as 'The Niagara of India'. Camped at the Athirapally waterfalls and the nearby forest areas, the team is planning to shoot for a grand action sequence with few scenes shot in Vagamon hill station as well. This schedule would go on for about 10 to 15 days more. A fantasy-thriller by genre, the film has lots of interesting elements in terms of characterisations and technical values as well. SKT Studios producing Puli features Hansika, Sridevi, Shruti Haasan, Sudeep, Prabhu and others in key roles. Devi Sri Prasad will render music, while Nataraja Subramanyam aka Nutty is cranking camera for Vijay's Puli.